This Christmas, may get many memories to spend and cherish with your loved ones. 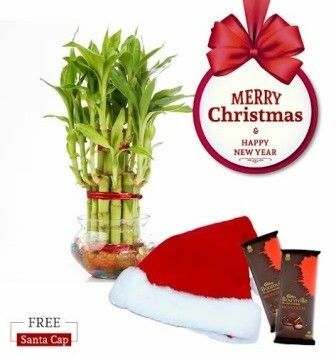 Add a gift of this beautiful Lucky Bamboo Two Layered plant in your celebrations. The combo also includes a cute red colored Santa cap and delightful chocolates, which will be a memorable gift for your loved ones. Dos 1. Change the water every 15th day 2. DO the pruning of old leaves and stem which turn yellow regularly to avoid fungal activity. 3. DO the pruning of roots 3 times a year using normal scissors. 4. Consider the lowest red ribbon as a water level indicator. Donts1. DON?T use chlorine water(usually tap water)as it kills the root. RO water is chlorine free and recommended. 2. DON'T over water or under water the plant. Ideally all roots should be submerged in water. 3. DON'T give direct sunlight otherwise the leaves will burn in summer , filterd light or morning sunlight is apt 4. Avoid temperature shock for better growth.